"I love my beautiful antlers!" said the Reindeer to himself. However, the Reindeer did not like his skinny legs. "Hey, look how thin my legs are. I want my feet to look better. I want to look beautiful from head to toe," he complained. One day, while looking his own reflection on the edge of the pond, the Reindeer heard a dog barking. The Reindeer was aware that dog hunters were heading into the place. The Reindeer was scared and ran away. While the Reindeer ran through the woods, his horns became tangled in the branches of a low-hanging tree. The Reindeer struggled to get his horns free from the branches. The Reindeer was getting anxious as he heard the barking of a dog getting closer. Finally he got free, and ran away on his thin legs. However, his antlers had been broken. The beagle was getting closer. The Reindeer was able to escape because it could run very fast. The Reindeer realised that his legs had saved him from danger. Since that day, the Reindeer has stopped looking at his feet as something bad or useless. 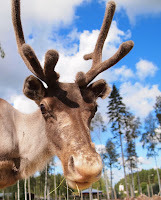 The Reindeer is also not as arrogant as before because his antlers no longer look beautiful. The Reindeer realised that beauty does not always bring good benefits. LESSON: Be thankful for what God has given to us, and do not ask for more than that.